In this blogpost i will be reviewing three scientific papers dealing with the haplogroups identified among African Americans and correlating their frequencies with possible African source regions. These studies can only represent the state of knowledge at the date of their publication naturally 😉 But they should be suggestive of the approximate regional distribution of African ancestry among African Americans. For a most recent study (2013) on African American mtDNA see: “Mitochondrial DNA diversity in the African American population“. I will however not discuss that paper as it makes no attempt to correlate American haplogroups with African regions of origin. Before i proceed some words of caution as usual, perhaps redundant for those who already know but it’s worth repeating as many people still tend to be misinformed about the true meaning of their haplogroups. Haplogroups (Y-DNA, mtDNA) only represent a very limited portion of your total ancestry and often date back from many thousands years ago. Autosomal DNA testing is the only way to find out about your complete ancestry. See figures below for visualization although generally speaking you will have to go back more generations than just 3 or 4 to find out about your complete African ancestry. In fact you will have to trace back to your first African born ancestor carrying your haplogroup in a direct maternal or paternal line to determine the relative contribution of the haplogroup to your ancestry. 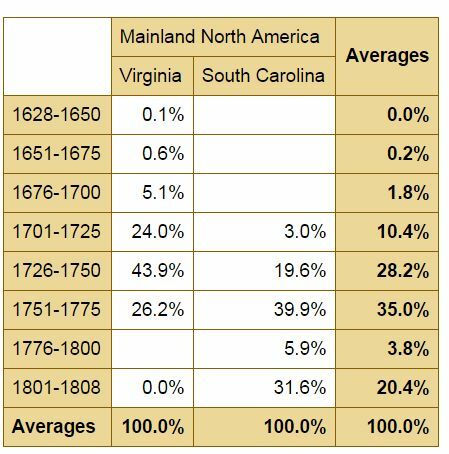 For African Americans this could take you back at least 7 generations on average to the mid 1700’s when most Africans arrived in the US (see this chart), but in some cases it might also take you back right to the 1600’s! Going with a conservative estimate you could have 128 ancestors around 1750 but in the 1600’s this will have increased exponentially to 1024! 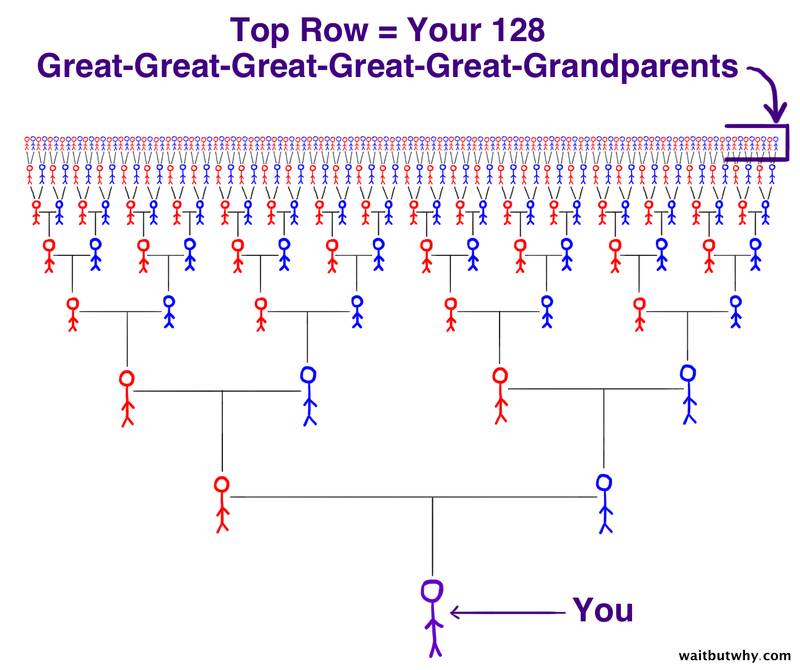 (see this link and also this one for a useful overview of the number of ancestors per generation). Of your dozens or even hundreds of African-born ancestors relocated to the US, your direct maternal/paternal ancestor would be only one, representing no more than 1% of your total ancestry, in most cases (see also “Fictional Family Tree incl. African Born Ancestors“). A minority of African Americans get tested with non-African haplogroups, a further proof that only autosomal DNA can tell you about your complete ancestry. As the greater part of African Americans will obviously still be predominantly African depite having a non-African haplogroup. Theoretically speaking even a person who scores 99% African in a DNA test could end up with a non-African haplogroup! These haplogroups are usually testimony of minor European geneflow among the African American population. Interracial unions most often involved European American males as measured by European Y-DNA but a considerable % of African Americans also carry European mtDNA. This is unlike most other Afro-Diasporic populations, thereby constituting a distinct feature of AA genetics i suppose. According to several studies it’s in between 8-10% (e.g. Stefflova et al. 2009. or Deason et al. 2012). Which might imply that generalizations about the nature of European admixture do not always apply as we all have individual family trees. Even if you personally do not have a European maternal haplogroup you could still have a European maternal ancestor through either your paternal family lines or those through your maternal grandfather, your maternal greatgrandfathers etc. ” Many African Americans are interested in learning more about their African roots and are willing to pay to have their mtDNA analyzed in the hope that it will match DNA from a particular African ethnic group. However, as more than half of the mtDNA sequences in the African database are identical to sequences from other ethnic groups, African-American mtDNAs will be much more likely to match sequences from multiple ethnic groups than sequences from a single ethnic group. When this result is coupled with the fact that 40% of African-American mtDNAs did not match any sequence in the database, it is clear that matches to a single African ethnic group will not be the outcome for most African Americans, and even when a match to a single ethnic group is obtained, multiple matches may occur in a larger database. This study might have a somewhat sobering message for those who are emotionally invested in their haplogroup test results. However in the interest of correctly identifying one’s ancestors it should be required to be critical of DNA testing companies and to very carefully scrutinize their claims. Wholeheartedly celebrating a certain ancestral lineage only to be told later it was wrongly assigned or incomplete information was given can be very sobering as well afterall (see also “What Tribe Am I?“). Basically what’s done in this study is that they compare an extensive database of “3725 mtDNA HVS-I sequences” with the mtDNA sequences of 2 African American samplegroups, one of them consisting of selfidentified Gullah’s. The outcome of this comparison can be seen below (it’s from their corrected paper version which appeared in 2007). For the Gullah samplegroup a perfect match with only 1 single ethnic group was found in 5 out of 74 cases and for the African American sample group it was 4 out of 97, implying that in about 95% of all cases no perfect single ethnic match was found! Rather a matching with multiple ethnic groups, sometimes also being from multiple regions, was a more typical finding. Undoubtedly this outcome is a reflection of widespread ancient population migrations across Africa and the continuous geneflow in between ethnic groups which themselves are also evolving all the time through ethnogenesis. 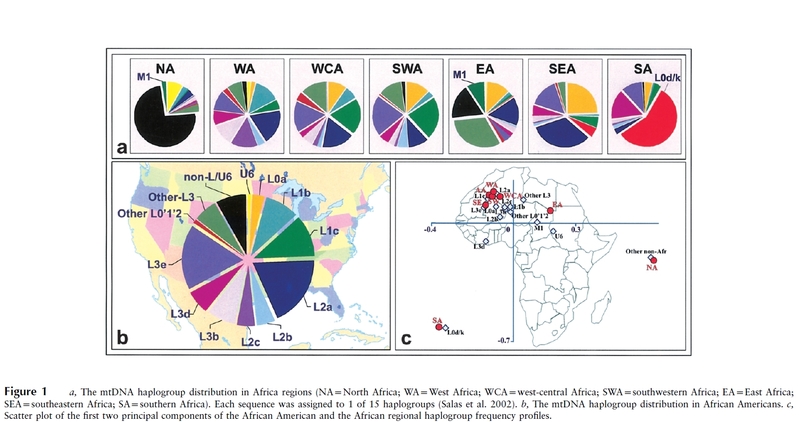 As seen on top of this blogpost this study’s main findings are that about 55% of African American mtDNA could be placed in West Africa and about 41% in West Central & Southwest Africa (Angola). This outcome is not very surprising if we compare it with documented slave trade records. Although the proportion of West Africa seems subdued, and the Central African share (incl. Angola) inflated. A splitup of about 75/25 could have been expected based on this graph below. But perhaps it’s because the West Central African haplogroups (mostly from Cameroon, see this link for full overview) fall in between. However like the authors mention themselves, mtDNA only tells part of the story, even when used in population studies. For the full abstract of that study see this link: “Mitochondrial DNA (mtDNA) haplotypes reveal maternal population genetic affinities of Sea Island Gullah-speaking African Americans“. To return to the Y-DNA study these were the population samples they used (also to be seen in the map above), it seems that especially crucial samples from Ghana & Congo/Angola were missing. In below graph their main finding of the South Carolina samples (AASC) being distinct from the other Afro-Diasporic sample groups (JM, ST & AADC) is clearly shown by the way it’s most closely clustering with the Mandenka (MAN) samples from Senegambia. Figure 2. Plot of the first two principal components of a Y chromosome genetic distance matrix estimated for 17 populations. A final overview of their findings is fascinating but also a bit puzzling. The African American samples from South Carolina (AASC) are being shown as having shared Y haplotypes with all the African sample groups, the highest number being shared with Nigerians (Yoruba’s, Igbo & Bini), the Upper Guinean groups coming in second place. However the other African Americans from Washington DC (AADC) and the West Indians (JM & ST) hardly share any Y-haplotypes, except amongst each other. Perhaps it’s because of the absence of Ghanaian samples but it’s also peculiar that only a few shared matches are found with the Igbo (IBO) samples while otherwise it’s mostly the Bamileke (BAM) from Cameroon or European Americans (EA). As a concluding observation it’s perhaps telling that the African samplegroups themselves have plentiful matches between each other; the Mandenka are sharing several Y haplotypes with the Yoruba for example. This entry was posted in African Americans, Anglo Caribbean, DNA Studies, Gullah, Jamaica and tagged mtDNA, South Carolina, Y-DNA. Bookmark the permalink. My maternal haplogroup is a subclade of L2c – L2c2a (exactly assigned from NG, FTDNA, and 23). I have moderate matches at HVR1 level, few at HRV1/HRV2 level, and none at full sequence (via FTDNA “Ancestral Origins”). Interestingly, at the HVR1 level, I have matches from Spain and Portugal. Senegal, Ghana and Kenya are included as well. However, at the HVR1/2, my exclusive African match (out of 3 matches) is from Senegal. Studies have shown that L2c occurs in high frequency in the Senegal-Gambia region. This may possibly hint to my most recent African maternal origin, the operative word being “possibly”. My YDNA Haplogroup is E-U174 (E1b1a7a), a subclade of E-M2 (E1b1a). An exact match with 12 markers is from Ghana (Ga). Twelve markers with 1 genetic distance, I have several; but for Ghana, again, I have 3 matches (2 Ewe and 1 Fante). Although this is a low resolution test (12 markers), the exact match from Ghana (Ga ethnic group) in relationship to the three 1 genetic distance matches from Ghana may hint to a YDNA with, at least, a genetic profile similar to the Ga-Ewe-Fante cluster. This is by far inconclusive; yet considering that the Ga and Ewe are very closely related genetically and culturally and live in close proximity to the Fante in Accra says something. Additionally, my highest ethnic estimate via AncestryDNA is Benin/Togo (46%? ), where the majority of the Ewe reside. Finally, the autosomal statistics that you referenced seems to be pretty accurate, since the DNA i inherited from Africa, according to all three major testing companies, indicates exactly 80%. An intriguing study would be comparing DNA samples from African Americans in Virginia (especially in and around Chesapeake Bay) with those from Nigeria (especially the Igbo) and/or Madagascar. As always, this was a most educational and great blog. The Ancestors love you!!! Thank you for your insightful comment my friend! You seem to have great experience in haplogroup testing. I’ve always been interested in further exploring my direct maternal lineage (L3e4) as it’s inherited from my greatgrandmother who helped to raise my mother when she was a young child. She also used to tell stories to my mother about her own mother, my greatgreat grandmother, so this family line holds a very special meaning to me. My maternal haplogroup is very frequently seen among Cape Verdeans especially from the islands where my family’s from unsurprisingly, also on the mainland it has increased frequency across Upper Guinea, but especially Guinea Bissau & Sierra Leone it seems. However it’s by no means unique to Upper Guinea, in lower frequencies it can also be seen elsewhere. About your maternal haplogroup L2c, i just uploaded an overview of haplogroups among 78 Gullah and it seems to be the most frequent among them, interestingly it also shows 1 L3e4 (https://tracingafricanroots.wordpress.com/dna-studies/haplogroups-aa/). I absolutely agree that a DNA study comparing AA’s with deep roots from Virginia with Madagascar and the Igbo would be very insightful. I’ve been intrigued about the stories of Madagascar ancestry (as measured by haplogroups as well as DNA matches and minor Southeast Asian %’s) it seems to be quite widespread even outside of Virginia, and i suspect it’s because it’s an early founding effect from the early 1700’s. The Igbo should have left a much greater genetical legacy, proportionally speaking but quite likely again as a founding effect. I have a good friend (African American) whose mtDNA haplogroups is M32c! I can see M1 showing up here and there but M32c… she so needs to delve into that piece of untold family history. I am African American, and I took the FTDNA mtDNA test indicating haplogroup L2b1b. However, I have 0 matches and have found no information on this haplogroup. I was hoping to narrow direct maternal ancestry to specific country/ethnic group. I already knew it was west african but paid for the test to learn more. Any ideas? Hello John, i’m sorry you didn’t receive any matches yet. It seems you’re in the same boat as the 43 out of 97 African Americans who were tested for their mtDNA but received no matches at all, as mentioned in the study above (Ely, 2006). I fully understand why you would want to narrow your direct maternal lineage down to one single ethnic group/country. However as described in this blogpost it’s very tricky and potentially misleading to rely on haplogroups alone. Another outcome from that Ely 2006 study was that only 4 out of 97 African Americans received a mtDNA match linking them to a single place/ethnic group. While 50 out of the same group of 97 African Americans had matches connecting them with multiple places/groups! So really the odds for a “perfect match” seem to be quite slim. Of course this could also partially be a database problem but more fundamentally it’s because haplogroups tend to be regionally widespread and not unique to any ethnic group. And at any rate they will only tell you something about a very small part of your total ancestry. I’m not aware of any information regarding your specific subclade but perhaps you’ll find this study useful it mentions the frequencies of L2b1 in several West African countries and even among selected ethnic groups (starting from page 654). From the looks of it might be a marker of Senegambian origins, however other scenario’s remain possible i suppose. Hello, John. My name is Christopher Frye, and my wife is Rozilene Marques Frye. We recently had her mtDNA test done through Family Tree DNA, her mtDNA haplogroup is L2b1b, too. My wife is Brazilian and we live in Brazil, so I’m writing you on her behalf, since her English is not very good. We thought it would be interesting to respond to you and see if we can exchange information. 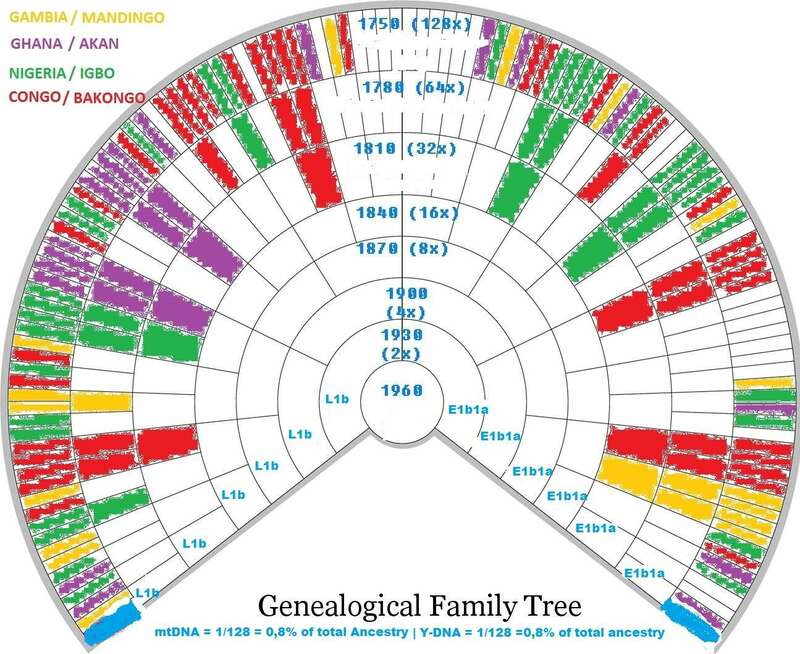 Family Tree says “Mandinka”. thanks very much for the information. i will have a look! Ha! Didn’t know this thread existed. I still have to formally test it, but for my Y-DNA side (my mtDNA haplogroup is European), I’ve had it estimated to be E1b1a7a (also called E1b1a1a1f1a1), which seems to be a subclade of E-M2 ( or E1b1a1), which is itself a subclade of E-V38 (or E1b1a). In any case, E1b1a7a seems to be the most common subclade of E-M2, and appears to have originated West-Central Africa (becoming more rare as you moved through West Africa). It seems to be most common in the Yoruba, but it’s next highest percentages appear to be in Bantu peoples across the border in Cameroon. Basically, it’s common from where we know the Bantu expansion originated. Funny thing is that I’ve yet to find a Yoruba match on Ancestry. So far, all my Nigerian matches have been Igbo or nearby and smaller neighbors of the Igbos. Maybe the Igbos score very high in the frequency of this subclade, but have simply never been the subjects of a study on this subclade. Perhaps is a very common subclade among all southern Nigerians.